Now that I have made maraschino cherries, let me tell you.. they are spectacular… you must try them with your manhattan… I’ll share the recipe when its cherry season in july! The absinthe addition is brilliant… must be delish! 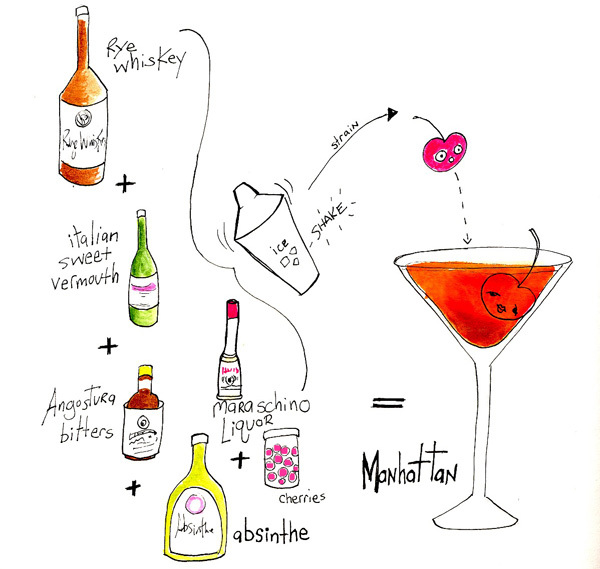 I don’t think Absinthe is at all apropriate in a Manhattan, Nor the Maraschino Liquor. Both of these seem to be simply there to up the ‘Cool’ factor of an already pretty nice drink. But I think the maraschino + absinthe is more true to the original. It’s from a 19th c recipes. You’re not the first to freak out about this post. But I guarantee this drink is smooth and delicious. deana – -I am really looking forward to experimenting with real maraschino cherries! Hi, I do believe this is an excellent blog. I stumbledupon it ;) I’m going to come back yet again since I saved as a favorite it. Money and freedom is the best way to change, may you be rich and continue to guide others.